Y.Y. Wong in 1933. Image courtesy Alexander Jay. Childhood photo of Y.Y. Wong from immigration papers, 1914. Image courtesy Alexander Jay. Mandarin pinyin Huang Yuyu (Class of 1925, Architecture) was one of Republican China's premier architects, a master of the "Chinese architectural renaissance" and contributor to the planning of China's new capital at Nanjing. Unusually for the early Chinese students at MIT, Wong had immigrated to the US during his childhood. Wong was a native of Kaiping in Guangdong province, an area with a well-established history of sending emigrants to Hong Kong and the US. As a boy, Wong attended the village school until age nine, when he moved to Hong Kong to attend the Ng Lee School, established by Presbyterian missionary Ida Greenlee. In 1913, Miss Greenlee brought Wong back to Seattle with her, and enrolled him at the Ng Lee School in Oakland, California, which later moved to San Francisco. Wong's father having recently passed away, his expenses were paid by a cousin in Hong Kong. After a short time at the school, clansmen brought Wong out east to Boston, where he attended the Pierpoint and Quincy Schools. In his after-school hours, Wong worked as a busboy in a Chinese restaurant, Mon Yen Low at 34 Beach Street, to help defray his expenses. He adopted the Christian name of "Perry." Making a new home for himself in Massachusetts, which already had a vibrant Chinese immigrant community at the time, Wong began moving toward his ultimate career as an architect, working as a draftsman. When Wong registered for the draft in September 1918, his draft card showed that he resided with a relative in Salem, Massachusetts, and was employed as a draftsman for the United Shoe Machinery Company in Beverly, also on Boston's North Shore. Wong spent 1918-1919 working construction for the Army at Camp Eustis in Virginia. After a year, he returned to the Boston area and found employment at the architectural firm of Coolidge and Shattuck, where he worked from 1919 to 1920. In 1920, Wong enrolled as a student at Tufts for a year, studying structural engineering before returning to Coolidge and Shattuck until 1922. While working, Wong remained active in the community, volunteering with the Chinese Boy Scouts Troop 34 in Boston Chinatown. Through this activity, he met other student volunteers, many from MIT. CSC group photo in MIT Technique 1924, 286. Image courtesy MIT Archives and Special Collections. At MIT, Wong was a member of the Chinese Students’ Club, the Rifle Club, and the Architectural Society. Following graduation, he worked as a draftsman at the prestigious architectural firm of Coolidge, Shepley, Bulfinch and Abbott, living at 11 Hansen St. in Boston's South End. Wong was admitted as a junior member of the American Institute of Architects. Wong's plan for new administrative center. Office of Technical Experts for Planning the National Capital, Shoudu jihua, Nanjing, China, 1929. 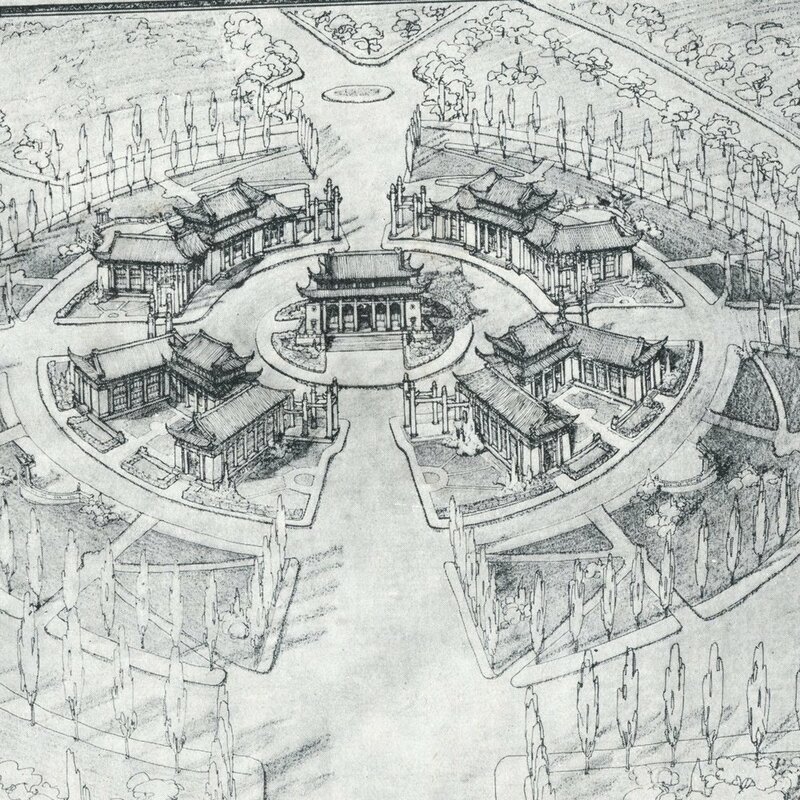 Wong's drawing for the Sun Yat-sen Memorial Hospital, Canton, China. Image courtesy Alexander Jay. In 1929, Wong took a leave of absence from his firm and accepted an invitation from the Harvard-trained engineer, Lin Yimin, to return to China to serve as principal architectural assistant for the Nanking [Nanjing] City Planning Bureau, formed by the national government in November 1928, with Lin as administrative director. The Bureau, and its Office of Technical Experts for Planning the National Capital, undertook the massive task of planning a new capital for Nationalist China's government in Nanjing to be made over as a "thoroughly modern city." Working with two American consultants, engineer Ernest Goodrich and architect Henry K Murphy, Wong was designated principal architectural assistant, and another MIT alumnus, CY Cho (Class of 1917, Civil Engineering), chief of the engineering staff. Wong had recently married (March 11, 1929) Sue Doy Lee, a beautiful Chinese opera performer who had immigrated to Boston. Preparing to move his family overseas temporarily, before exiting the country Wong obtained a "Return Certificate for a Lawfully Domiciled Chinese Laborer" (Form 432) from the US government in March 1929. Owing to the Chinese Exclusion laws that were in effect at the time, this certificate was necessary to guarantee his right to return to the US after a temporary stay in China. In Nanjing, Wong was invited to join the Nanjing Sun Yat-sen Memorial Park Management Committee, established in 1929, and served as Architect to the Sun Yat-sen Mausoleum and Park Commission, and also as a technical specialist for the Ministry of Railways. When a design competition for the new capital and its central administrative zone was launched in 1929, Wong joined with Zhu Shenkang (Howard Jee) to produce a top-ranked entry, which reflected influences from Haussmann’s Paris, the National Mall in Washington DC, and Beaux-Arts style, combined with traditional Chinese architectural and planning elements. Their design was praised by the judges as grandly patriotic. Regrettably, the Nationalist Party’s ambitious plans for the new capital were abandoned, and Wong’s vision was never implemented. YY Wong drawing. Date unknown. Image courtesy Alexander Jay. 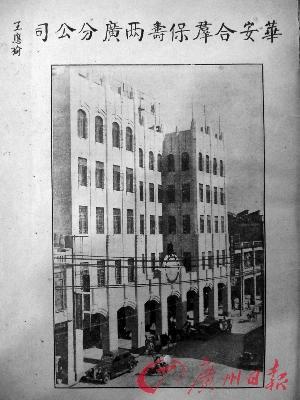 One of Wong's representative works is the "New Women's Dormitory" for Lingnan University (merged with Sun Yat-sen University in 1952), designed and built in 1933. Lingnan University was the first coeducational university in China, thus necessitating the construction of two women's dormitories in the early 20th century. Also known as "Moon Palace," the "new women's dormitory" was built with funds raised in the US as well as from women in Guangdong province. Built in red brick with a green tile Chinese-style roof, the building combined Western and Chinese architectural features, as was characteristic of the new public architecture of the era. Wong's interest in classical Greek style, the subject of his undergraduate thesis, can be seen in the design. 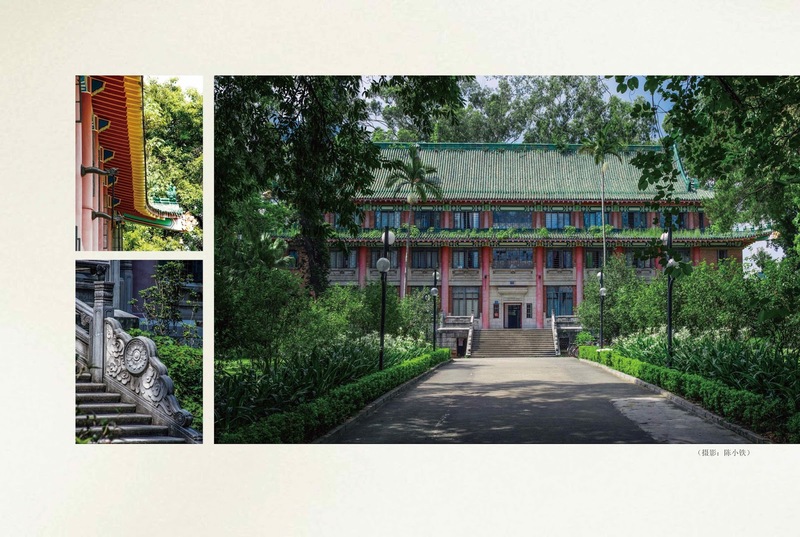 The building is historically significant because it is one of the few buildings on Sun Yat-sen University's "Red Brick Campus" or "South Campus" (the former location of the Lingnan campus) designed by a Chinese architect. Most of the other buildings were designed by American architects with offices in New York or China. In 2000, the building was designated on the “Guangzhou Outstanding Modern and Contemporary Architecture Protection List,” and it was declared a Guangdong Province cultural relic in 2002. Photo of "Moon Palace Dormitory," Sun Yat-sen University, Guangong by Chen Xiao-tie. Used with permission. In sharp contrast, the Hua An Towers was built in an Art Deco style consonant with global trends of the era. The massive building had commercial space on the first floor, offices and meeting rooms on the second floor, six units of modern apartment-style housing on the third and fourth floors, 30 units of single-occupancy (male) apartments on the fifth floor, a banquet hall on the sixth floor, and a Sino-European garden on the roof-top terrace. Photo of YY Wong Residence, Guangzhou by Chen Xiao-tie. Used with permission. Wong's own Art Deco style residence in Guangzhou, built for his growing family, was recognized as a historic building by the Guangzhou city government in June 2014. In addition to his practice, Wong taught at several universities, including Lingnan University and Sun Yat-sen University. Thus Wong became one of the leading Chinese architects of his time, making major contributions to urban planning, architecture, and architectural and engineering education during a critical moment in modern Chinese history. Following the Japanese invasion of China, Wong sent his family to Hong Kong for safety and went to work for the CAMCO (Central Aircraft Manufacturing Company) facility in Loiwing, Yunnan, supporting the war effort. In this work, Wong once again collaborated with other MIT alumni (see also entry on Wong Tsoo). Tragically, Wong was killed in a Japanese bombing raid on Yunnan’s Baoshan in 1942. An exhibition in honor of Yook Yee Wong, “A Patriot on His Way Home: Exhibition for the Overseas Chinese Architect Y. Y. Wong,” was held at the Guangdong Overseas Chinese Museum in Guangzhou, China in September 2015, curated by Professor Peng Changxin 彭長歆 of South China University of Technology, and Alexander Jay 謝志偉. Notes: MIT's first Chinese graduate in architecture was Sung-Sing Kwan (Class of 1919, BS 1918), founder of the first Chinese architecture firm: Kwan, Chu & Yang Architects of Tianjin. Photos of Wong can be viewed in World Journal, 2015. I am grateful to Alexander Jay for information and materials on Wong. Wong's work has been studied by Prof. Peng Changxin, who is currently researching American Architects in China (1840-1949). Sources: A detailed biography of Wong can be found in 不断迁徒的爱国者 ——华侨建筑师黄玉瑜生平事迹展/A Patriot on His Way Home: Exhibition for the Overseas Chinese Architect Y. Y. Wong, exhibition brochure from the Guangdong Overseas Chinese Museum, Guangzhou, China, 2015, curated by Professor Peng Changxin and Alexander Jay. See also the Chinese American Eyes blog and the World Journal, January 4, 2015. 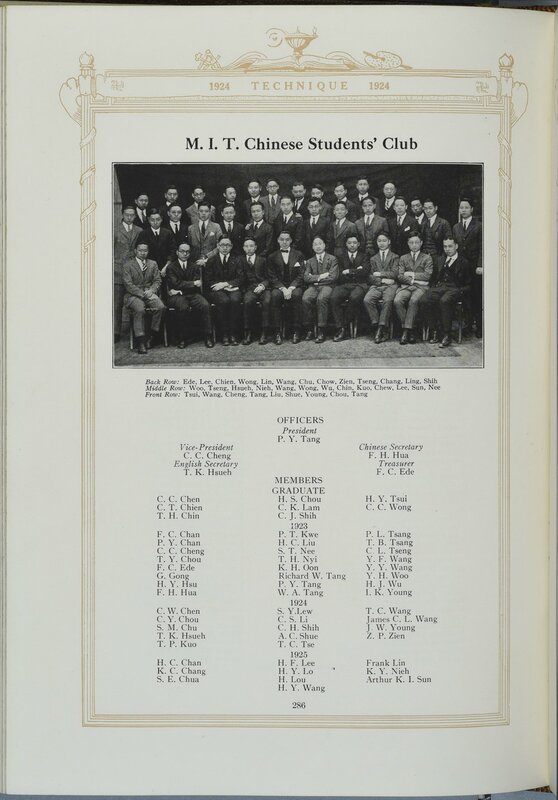 Other information about Wong is contained in the MIT Chinese Students Directory: For the Past Fifty Years, 1931, Alexander Jay, Yook Yee Wong Book 1: 1902 to 1919, Yook Yee Wong Book 2: 1920 to 1929, Yook Yee Wong Book 3: 1930 to 1942, United States, Selective Service System. World War I Selective Service System Draft Registration Cards, 1917-1918. Washington, D.C.: National Archives and Records Administration. M1509, Registration State: Massachusetts; Roll: 1674430, Yook Yee Wong, Sept. 12, 1918, serial number 96, order number 1530. On prize, see MIT President's Report 1923, p 65, Chinese Students Directory, p. 26. MIT Technique, 1923, 268, 283, Technique, 1924, 286, 307, Tyau, MTZ, Two Years of Nationalist China, Shanghai: Kelly and Walsh, 1930, 379-380, Tsui, Carmen C.M. "State Capacity in City Planning: The Reconstruction of Nanjing, 1927-1937." Cross-Currents: East Asian History and Culture Review 1, no. 1 (May 2012): 12-46, Peter G. Rowe and Seng Kuan, Architectural Encounters with Essence and Form in Modern China, MIT Press, 2004, pp 73-74, 不断迁徒的爱国者 ——华侨建筑师黄玉瑜生平事迹展/A Patriot on His Way Home: Exhibition for the Overseas Chinese Architect Y. Y. Wong, exhibition brochure from the Guangdong Overseas Chinese Museum, Guangzhou, China, 2015, Office of Technical Experts for Planning the National Capital, Shoudu jihua, Nanjing, China, Charles Musgrove, "Monumentality in Nanjing's Sun Yat-sen Memorial Park," 2007. Tsui, Carmen C.M. "State Capacity in City Planning: The Reconstruction of Nanjing, 1927-1937." Cross-Currents: East Asian History and Culture Review 1, no. 1 (May 2012): 12-46. Peter G. Rowe and Seng Kuan, Architectural Encounters with Essence and Form in Modern China, MIT Press, 2004, pp 73-74, YY Wong, "Architectural Trends in Canton," ca. 1934, in Alexander Jay, Yook Yee Wong Book 3: 1930 to 1942, 8-9.